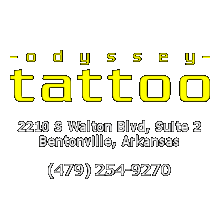 To get a “price quote”, please come in to discuss the price of your tattoo with a tattoo artist. There are so many factors that we need to know about in order to give you an accurate estimation, so we do not give price quotes over the Internet or telephone. If you can, bring in a large photos. With a large photo we can more clearly answer your questions and even give you an approximate cost. We won’t give a quote on an item that we haven’t seen in person, but once we do give a price we won’t change it later unless there is a requested change. We treat people as we want to be treated. Scheduling appointments is both preferred and recommended. You can contact the tattoo artist of your choice to set up a consultation by calling the studio during regular business hours.